Independent advisors see growth ahead, according to Schwab's latest Independent Advisor Outlook Study. 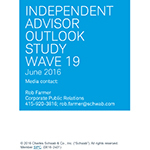 TUCSON, Ariz.--(BUSINESS WIRE)--Schwab Advisor Services has released findings from its 19th semi-annual Independent Advisor Outlook Study (IAOS), which reflects the opinions of 930 advisors at independent investment advisory firms that custody with Schwab. The study results, representing more than $300 billion in assets under management, were announced today to a group of advisors during Schwab’s annual EXPLORE conference. Complete findings are available for download here. The Independent Advisor Outlook Study, conducted for Schwab Advisor Services by Koski Research, has a 3.2% margin of error. Koski Research is not affiliated with nor employed by Charles Schwab & Co. Inc. All data is self-reported by study participants and is not verified or validated. Advisors participated in the study from April 19 – May 1, 2016.